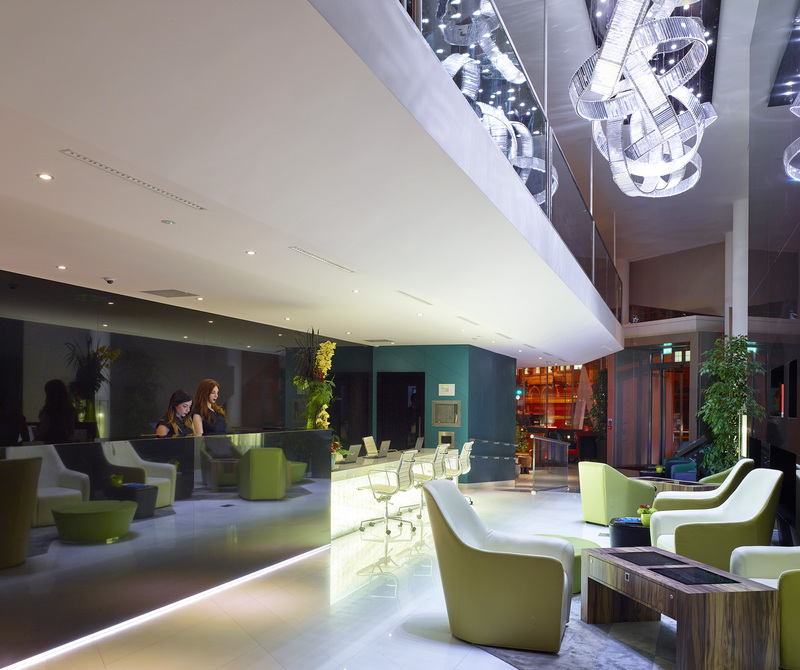 M By Montcalm London is right at the heart of London’s Tech City, surrounded by start-ups and creative clusters. 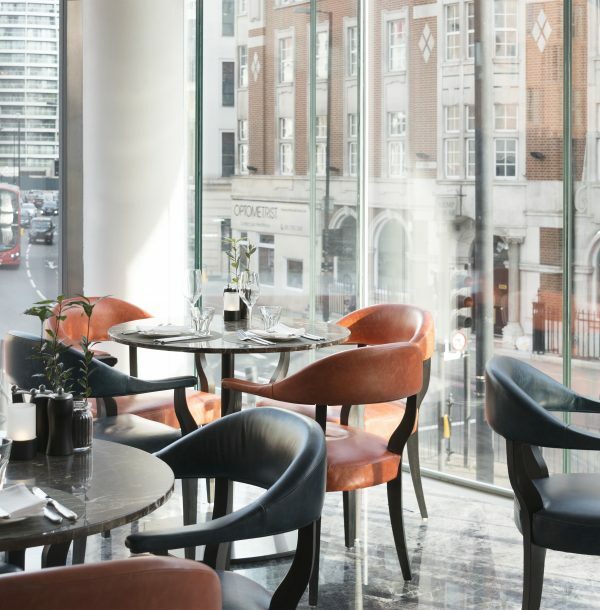 Over a weekend we stayed at the M by Montcalm London, which is a 23-story 5 star hotel set over 17 floors near Old Street tube station in Shoreditch, and is a stone’s throw from Silcon Roundabout, Europe’s answer to Silicon Valley. It was designed by architects Squire and Partners and delivered in collaboration with Executive Architects 5 Plus, and completed in July 2015. 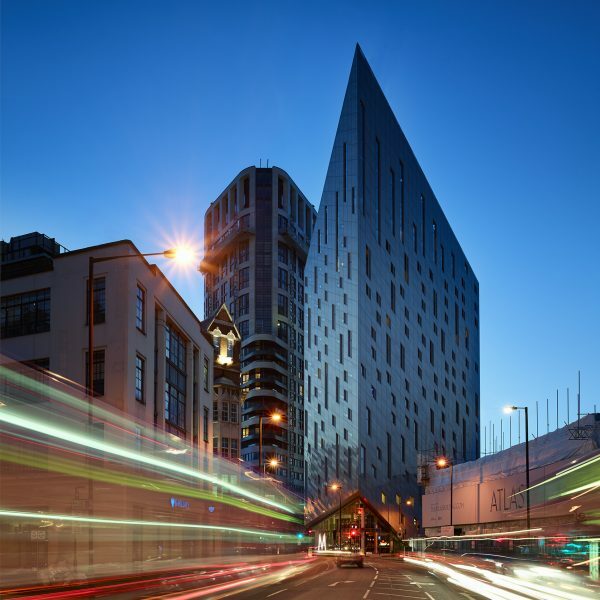 The unusual building design, which is strikingly-angular, was based on the proximity of the hotel to Moorfields Eye Hospital, which sits right opposite. The architects suggested that the idea of the optical and the visual design takes inspiration from the hypnotic, illusionary artwork of Bridget Riley. After arriving by taxi we were warmly welcomed by Adrian in the pre-reception area, who served us a delicious cocktail and took our bags; this was a calming start to our stay. We then met Nolwenn who checked us in smoothly and efficiently – this can also be completed via a host’s iPad to avoid missing out on the luxury of your room. Nolwenn then gave us the keys to our room whilst the lovely Adrian took us to our room and explained how all the high-tech amenities worked from under floor heating in the bathroom to the electronic curtains. We were highly impressed by Handy a smart phone situated by the bed which allows the user complimentary unlimited data and free calls, the device could be taken out of its stand and used out and about, a really helpful feature for someone who may not know the area during their stay. 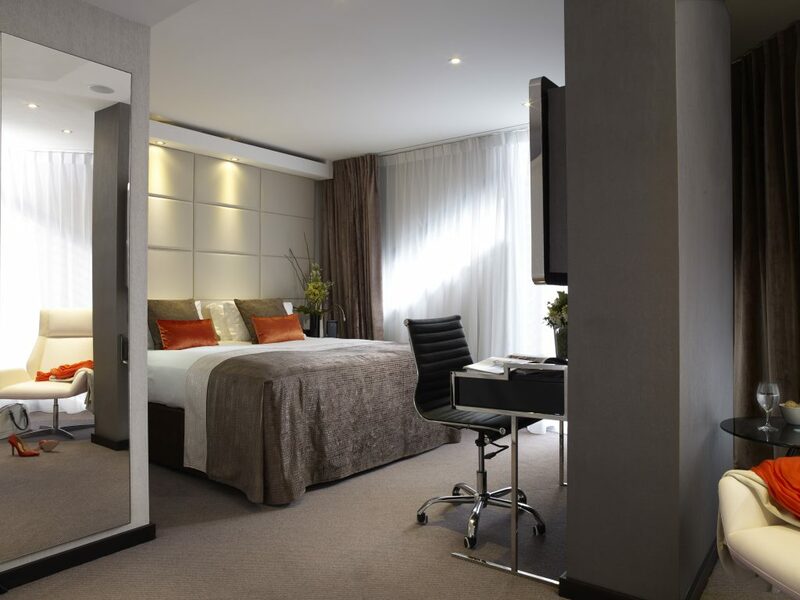 The suite overlooked the Moorfield Eye Hospital, where we could see the eye clock over the entrance that inspired the ultra chic design of the hotel. We could also see over the rooftops of London City where we could see for miles and miles. The décor is created from hues of white, grey and black – giving an elegant and modern feel. The lighting in the room is spectacular and would be a huge hit with any instagrammer with lights that could be set to many modes. The bed for the night was comfortable with premium white cotton linen and offered a relaxing, cosy sleep with pillows you just sink into. The addition of being able to open the curtains from one’s bed dressed in a fluffy bathrobe was a wonderful experience, allowing one to see the City as the sun rose. The bathroom is spacious, with a nice shower, basin, make up mirror and large mirror, it is also stocked with Hermes goodies which smell divine and good quality towels. The room itself is broken up by a panel – which holds a large TV with plenty of choice of channels. The speakers in the room were good quality sound and you can connect it to your phone via Bluetooth, which is convenient, and the WiFi is good. A writing desk – with supplies, sofas and chairs are also situated in the spacious suite. The mini bar was well stocked and a Nespresso coffee machine was provided; it was no trouble to call down to ask for more pods or tea bags if you prefer to use the kettle provided. The room is well equipped and you are tempted not to leave the room with all the amenities you could ever need. 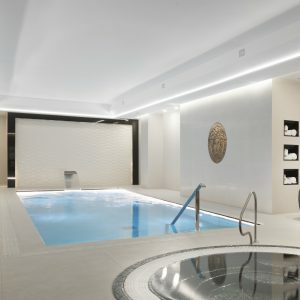 The hotel also features a large spa and fitness centre on the bottom floor – the gymnasium offers state-of-the-art Matrix equipment for you to get the most from your workout. Stepping away from the serenity of the spa you will discover a tech-enhanced, airy and expansive space equipped with the latest cardio machines which are generously endowed with large-screen TV’s. You will find an array of international satellite and music channels at your fingertips, and with complimentary WiFi -multi-tasking is easy. The gym offers a resistance machines for any level and an extensive selection of free weights for experienced lifters. Refreshingly spacious, with equipment to impress even the most seasoned gym-goer, you might just spend longer in here than you had planned. 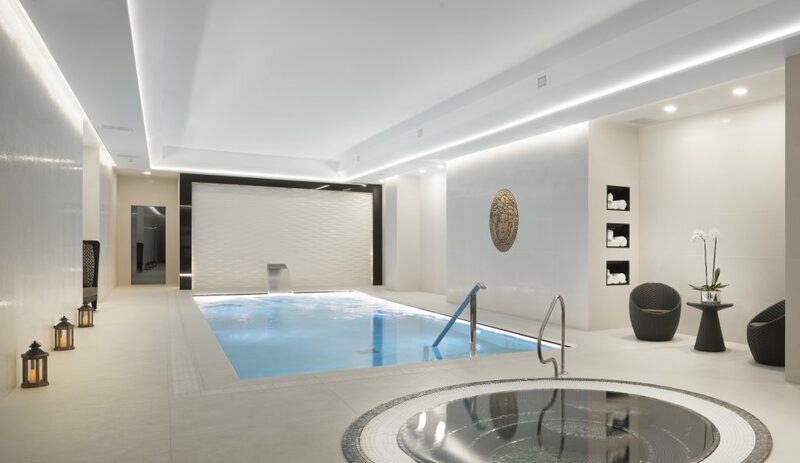 In addition to their fantastic gym facilities, M Spa is the ultimate urban sanctuary. Studded with gold leaf tiles, the pool, jacuzzi, sauna, steam room and experience showers invite blissful relaxation. You can also book at an extra cost treatments in one of their treatment rooms. The treatments are exclusively crafted using the world’s most luxurious products to leave you feeling utterly pampered. During our stay we also had the pleasure of dining at Plate, the hotel’s restaurant situated across two floors. The restaurant offers a great selection of food and on our lunch we went for the three course menu which began with different types of incredible breads baked in-house. These were served with whipped butter with amazing flavours including balsamic, onion and plain butter – these were divine with the marmite sough dough and mushroom brioche. Hassan who looked after us served a welcome glass of Prosecco as we perused the menu and tempted our taste buds with the breads! For our starters we went for the sea trout, which was a summery dish with a lemon cream, beetroot and rye crisp which added a crunch. The other choice was a Confit chicken terrine with a quince jelly which added sweetness; a winter’s day dish. Hassan paired this with Pinot Grigio Delle Venezie – straw in colour with light golden hues, it has a fruity bouquet with a subtle, fresh flavour. Mains were chosen by Hassan – the chicken breast, which was succulent with new potatoes and hispi cabbage. The jus on the chicken was seasoned well and the skin on the chicken was crispy – cooked to perfection and the breast meat was tender and tasty. Dessert was next and we went for the Pumpkin brûlée, and Sticky Toffee Pudding. Both deserts were different in flavours and textures. The sticky toffee pudding, a staple for any desert menu, was a classic English dish and very welcome on a cold winters night, a great portion size as well. We were drawn to the pumpkin brûlée on the menu as it was something we had never tried, it had a gingery taste, candied pecans on top and very different to your usual brûlée, it was a light dessert and a perfect end to the meal. Hassan was attentive and knowledgeable and a real delight to talk to, we were also greeted by Frederic, Arty and Tom who gave us their time and recommendations from drinks to food during our stay. The attentiveness by the team included a fun evening in the bar, where there was a lively atmosphere, to a fabulous breakfast the next morning. At breakfast we got to sit upstairs over looking the reception area. The breakfast is just as tasty as lunch with chef’s cooking the breakfast fresh and also cooking to order – nothing is too much trouble for the team. The staff here are really friendly and extremely helpful before and during our stay at both Plate and the hotel. People working here are the true value of this marvellous hotel. 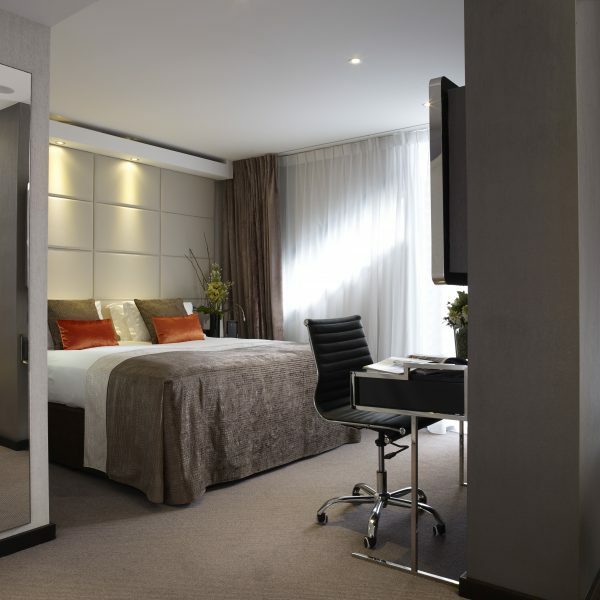 If you are looking for 5 star luxury away from the usual haunts of Mayfair or the West End then M By Montcalm London is the perfect place for you.